This plate is the second view which Vasi dedicated to Campo Vaccino (Cow Field), the name used in the XVIIIth century for the site of the ancient Roman Forum. This view shows its eastern part (for the western one click here). The alley shown in the plate was known as Stradone di Campo Vaccino and it was opened in 1536 by Pope Paul III for the expected visit to Rome of Emperor Charles V; he wanted to impress his guest by showing him the remaining monuments of the ancient city; the opening of the alley led to pulling down many medieval houses and towers which over the centuries were built above the ruins of temples and basilicas. Possessio, the procession which accompanied the newly elected pope from the Vatican to S. Giovanni in Laterano, went through Campo Vaccino using this alley. The view is taken from the green dot in the 1748 map here below. 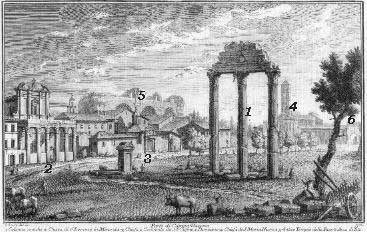 In the description below the plate Vasi made reference to: 1) Colonne antiche (Tempio di Castore e Polluce); 2) S. Lorenzo in Miranda; 3) SS. 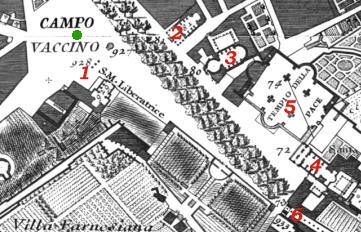 Cosma e Damiano; 4) S. Maria Nuova; 5) Tempio della Pace (Basilica di Massenzio); 6) Arco di Tito. 5) is covered in another page. The dotted line in the small map delineates the border between Rione Campitelli (left) and Rione Monti (right). In 1765 Vasi covered this part of Campo Vaccino in a larger etching. The excavations carried out during the XIXth century unearthed the foundations of several Roman monuments; in 1882 Stradone di Campo Vaccino was excavated until the remains of Via Sacra were found; it was the most important street of the Roman Forum; it linked Arco di Tito with Arco di Settimio Severo; by comparing the plate with the current view at selected locations such as the access to S. Lorenzo in Miranda/Tempio di Antonino e Faustina it is possible to gauge the amount of earth/materials which over the centuries covered the ancient street. This build-up of earth/materials was due to the collapse of many buildings and to the fact that since the XIth century Cloaca Maxima, the draining system built by the ancient Romans, was obstructed. 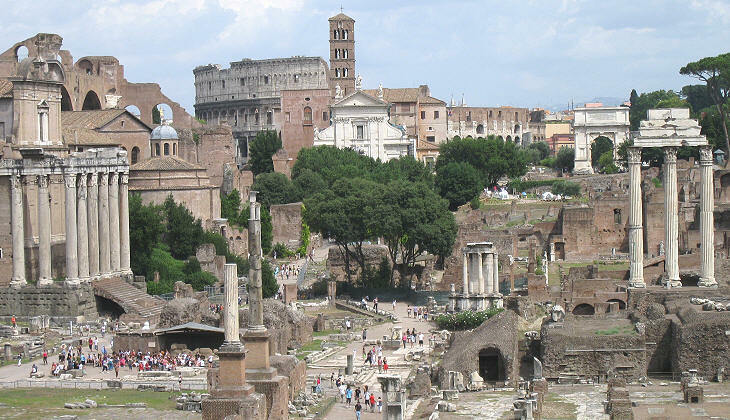 In autumn rain from the nearby hills flowed into the Forum carrying mud which solidified during the dry season. 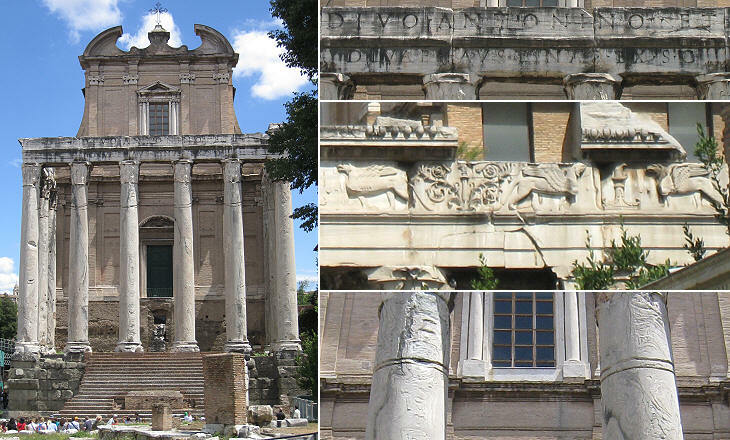 In general Italian archaeologists followed a conservational approach in the restoration of the Forum monuments; they did not attempt to reconstruct them, the only remarkable exceptions being Arco di Tito and to a minor extent the partial reconstruction of Tempio di Vesta (the small round building at the centre of the photo). The temple was built after the victorious battle at Lago Regillo (496 BC) during which the Romans saw Castor and Pollux galloping at their side. It is located opposite Fonte di Giuturna, a holy spring where the two stopped with their horses before announcing the victory to the people left in the city. The temple was rebuilt several times and the three remaining columns were part of a reconstruction by Emperor Tiberius. The marble for them came from the Greek island of Paros. 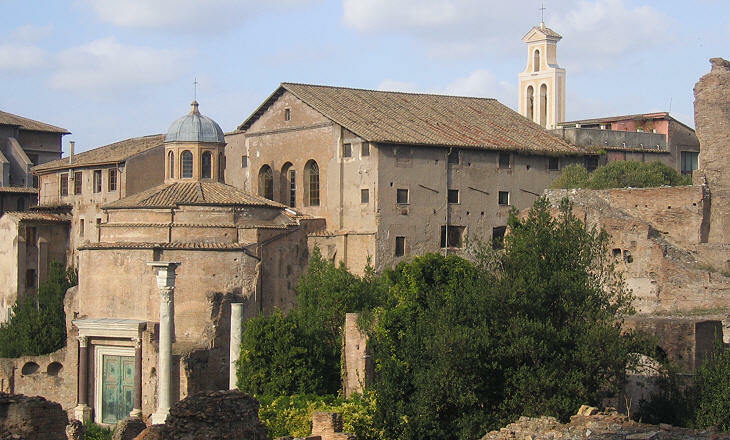 The temple is also shown in a plate dedicated to S. Maria Liberatrice, which provides another view of the Forum. 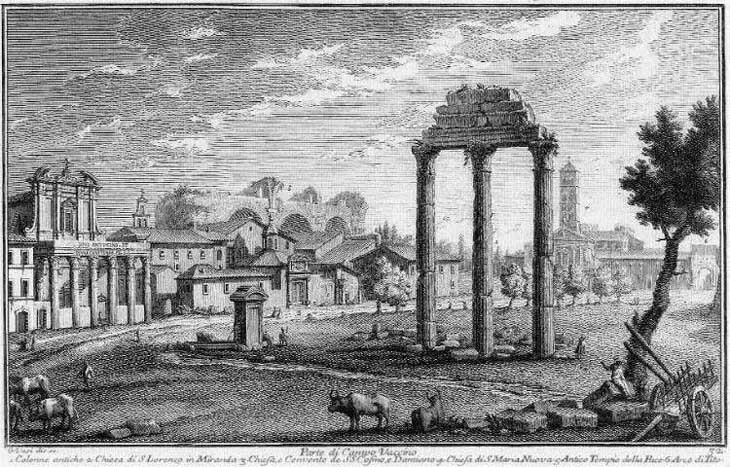 There is uncertainty about the origin of the word Miranda added to the dedication to St. Lawrence; Vasi and with him many other writers of old guidebooks suggested that it was the gerund form of the Latin verb mirare, thus meaning that the church was located in a place (the Roman Forum) which called for admiration. It is now thought that the word derived from a (lost) medieval monastery founded by a woman called Miranda, because when the cell of the Roman temple was turned into this church (probably in the VIIIth century), aesthetic criteria were not highly regarded and ancient temples were despised. In 1430 Pope Martin V assigned the church to Universitas Aromatariorum, the guild of pharmacists and perfumers to which it still belongs (click here for a list of churches belonging to a guild). At that time the portico of the ancient temple was mostly hidden by medieval additions. In 1536 Pope Paul III had them removed in order to impress Emperor Charles V. Between 1601 and 1607 the church was largely modified and Orazio Torriani designed a new façade, which adds to the beauty of the ancient columns by emphasizing their vertical lines. The temple was built in 141 AD by Emperor Antoninus Pius in honour of Annia Faustina, his deceased wife. After his death the temple was dedicated to him too and the two names appear on the inscription. Coloured marble from Karistos (known as cipollino) was employed for the columns of the portico. When Pope Martin V assigned S. Lorenzo in Miranda to the pharmacists' guild, he probably was influenced by the fact that a church which stood very near S. Lorenzo was dedicated to Cosmo and Damiano, the patron saints of doctors (and barbers). The church was consecrated in the VIth century, during the Ostrogothic Kingdom when Amalasuntha, daughter of King Theodoric, gave to the pope a rectangular building which originally was a library of Tempio della Pace and an adjoining circular building which traditionally was thought to be a Temple dedicated by Maxentius to his son Romulus. The church was largely modified in the XVIIth century because its original floor was below the level of the street owing to the accumulation of earth/materials: for this reason the entrance from the circular building was significantly raised. In 1897 this section of the church was separated from the rest and it became part of the archaeological site; the entrance returned to its original location. The lock of the bronze doors is still working. 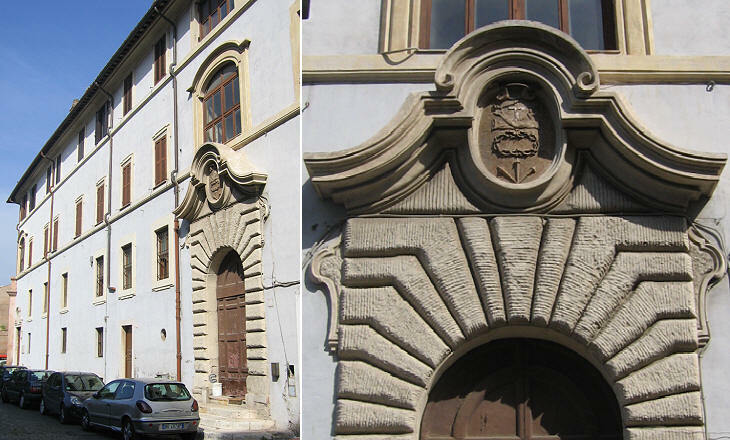 The convent adjoining the church was redesigned between 1626 and 1632 by Orazio Torriani for the Franciscans of the Third Order to whom the church was assigned in 1512. 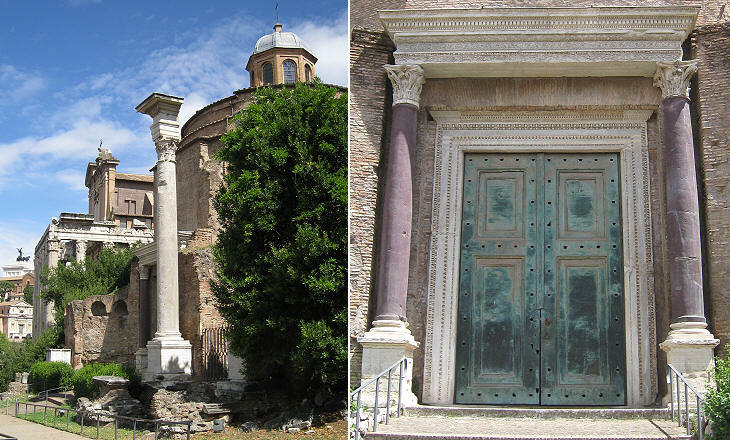 The church, initially a small oratory, was built on the western terrace of Tempio di Venere e Roma. In the IXth century when nearby S. Maria Antiqua was abandoned the oratory was enlarged and embellished and in the XIIth century a tall bell tower was added. The church was restored by Pope Gregory XI, the pope who left Avignon and returned to Rome; he is buried there. In the early XVIIth century the church was largely renovated and it had a new façade by Carlo Lambardi; on this occasion it was also dedicated to S. Francesca Romana, the founder of Monastero di Tor de' Specchi; because this saint is still very popular in Rome many weddings take place in this church. 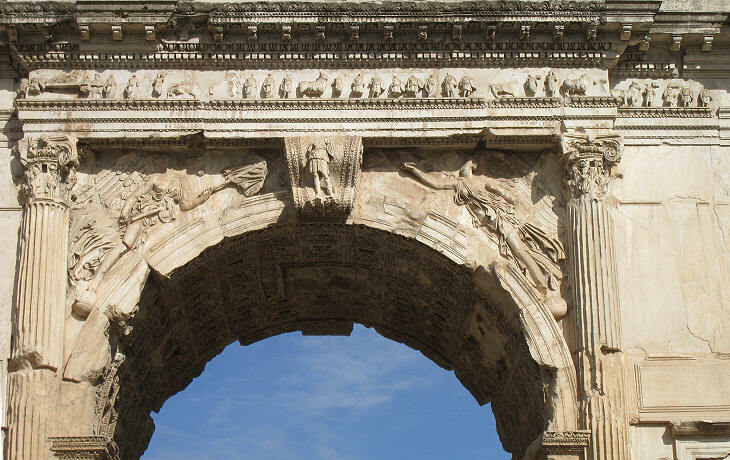 The arch was built by Emperor Domitian and by the Roman Senate to celebrate Emperor Titus. During the Middle Ages the arch was incorporated into the fortifications built by the Frangipane around Colosseo and it was used as a gate. Pope Pius VII in 1822 freed the arch and asked architect Giuseppe Valadier to add the missing sections; this was done in a way that the original parts are clearly identifiable from the additions. 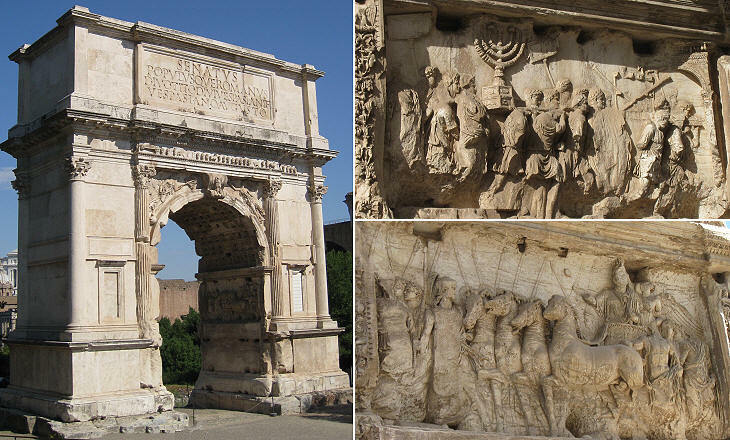 The interior of the arch retains two panels depicting scenes of the Triumph of Titus after his campaign in Palestine. See a page devoted to this triumph. Learn more about the inscription of the arch. 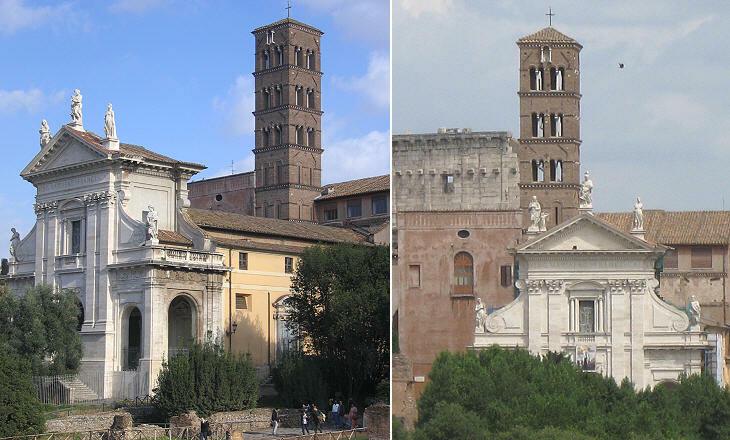 Le due colonne antiche, che si vedono accanto a detta chiesa, e appoggiate al nuovo oratorio de' fratelli della Via Crucis, una col capitello ed altra senza, ambedue sepolte più della metà, c'insegnano quanto bassa era prima la strada e la chiesa ancora, nella quale l’anno 1582. furono ritrovati i corpi de' ss. martiri Marco, Marcellino, e Felice II. Pontefici, i quali insieme con i corpi de' fanti Titolari, e quei de' loro consobrini Antimio, Leonzio, ed Eutrepio si conservano in essa, e nell'altare maggiore si custodisce l'immagine della ss. Vergine, che stava nella chiesa sotrerranea. Li mosaici intorno alla tribuna sono antichi, e le pitture intorno alla chiesa sono di Marco Tullio. Arco di Tito Molto sguarnito si ritrova questo celebre arco il quale però dall'iscrizione, che ancor esiste nella parte verso il Colosseo, e per li bassirilievi con il candelabro del tempio di Gerusalemme portato in trionfo da Tito, e Vespasiano, ci viene assicurato esser dello. Altra iscrizione era da questa parte, ma è stata tolta insieme con gli altri ornamenti da' nemici della verità, e delle belle memorie. 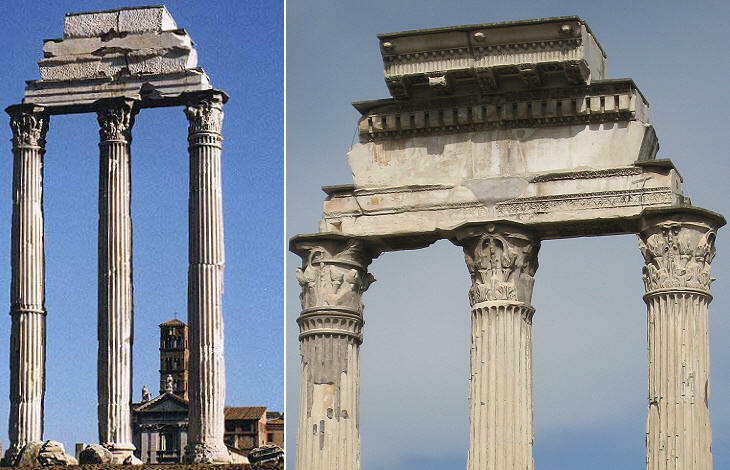 Le tre gran colonne, che si vedono dinanzi a questa chiesa (S. Maria Liberatrice), furono vanamente credute del tempio di Giove Statore, ma piuttosto sono di quelle, che cuoprirono il Conmizio. Presso a questo si crede essere state le colonne, che ora si conservano nella chiesa della Traspontina, alle quali furono flagellati i ss. Apostoli Pietro, e Paolo. Le grosse muraglie appoggiate alla detta chiesa ridotte ad uso di granaj, sono credute essere della Curia Ostilia, dove il Senato trattava le cose del pubblico, che fu distrutta dal fuoco, quando vi si abbruciò il cadavere di Publio Clodio Tribuno del popolo, nella quale poi vi fu fatta la Curia Giulia. Quivi furono i Rostri vecchi, e tra questi ed il Comizio, il Lupercale, ed il fico ruminale, sotto cui furono trovati Romolo, e Remo allattati dalla lupa; e però vi fu eretto un tempio, che ora è dedicato a s. Teodoro martire, come a suo luogo diremo. Da questa chiesa fino a quella di san Lorenzo in Miranda, e poi dall'Arco di Settimio fino alla chiesa della Consolazione, fu il celebre Foro Romano, e appresso le tre gran colonne il lago Curzio, in cui per amor della patria Curzio cavaliere Romano si buttò, secondo che si legge, entro una voragine, ivi improvvisamente aperta.